Rubenerd: I’m 20! And Useless eBay Purchase! I’m 20! And Useless eBay Purchase! No more being a teenager! Yes I know it's only a number but given my personality not having 'teenager' stigma stuck to me can only be a good thing. Problem is even now if I go to a bottle shop etc and buy a light beer, they ALWAYS ask for ID because they say I look 16-17. Great. Check it out, it has… wait for it… a 486 processor! 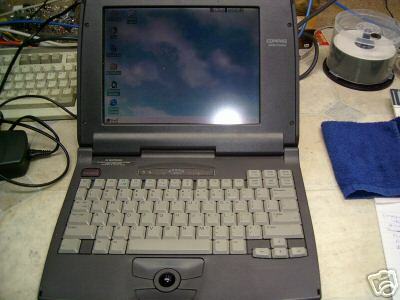 And a 700MB Hard Drive, Floppy Drive, PCMCIA, VGA Out, PS2, Serial Port, LPT Port, Colour 11.3'"Screen, ext 336 Modem, Carry Bag and Power supply. Why do I want such a blazingly fast computer? Well our family's first machine was a 486SX back in 1989 and it was damaged beyond repair when we moved to Singapore in the 90s. Ever since then I've wanted another 486 just to play my classic DOS games such as Commander Keen 1-3 (never had 4-7, only the demo of 6) etc… all on a Windows 3.0a machine of course ;). Should I get it? I know I'm trying to get rid of crap, but it's awesome. And I'm 20. Yeah.